Woke up in the morning at 7.30am..
Why am I up early? Depart at 8am, reach at 8.05am. Ha~! its near to my house! thank god~! Queue up for the number, then only realize Opps! I forgot my passport~! I guess if i didn't flirt with him, opps! i mean chat with him, i dont think he will let me have my number instead, he will want me to go get my passport and queue all over again~!! Than, I quickly dash out of the office, ran to my car, start my engine and VrooOoomMMmm~~~!!!! NO SIGHT OF MY PASSPORT~!!! then only, something strike my mind~!!! ArghhHhh~!!!! What a blur queen I am~! I am the Sotong girl~! Quickly hope back to my car and rush myself back to the emigration office, PHEWW~!!! luckily my turn ain't over yet~! that time was the number 1034.. 8 more to my turn.. i sat and wait, it was fast.. submitted my forms, old passport, photos and etc, i was asked to wait for my turn to make payment at the counter 13. Ok, so i waited in front of the counter. Tic toc, tic toc... time passed. Half an hour gone, and its still not my turn to pay~!! WTH! the cashier teller just sat there, not calling for any numbers, looking at her screen, chatting with the guy beside and keep laughing~! WTF! but still, its Malaysia! What else do you expect! so, yea.. no choice but hold on to the anger and keep waiting... finally 50mins was gone, and yea! its my turn now! thank god! because I am almost entering the hunger to dead status~ Quickly gave her the money, and she gave me a receipt and remind me to come and collect my passport at 10.45am! See? things can be done in a really fast speed, but she drag and wasted our precious time. I took off and head for my breakfast, was so damn hungry! I took 1 roti Tampal, and 1 roti Planta myself!!! WTH! that's alot of calories my dear!! wth im thinking that time! maybe just trying to avoid myself to faint there due to hunger~ haha! tic toc, tic toc, an hour passed... its 10.50am.. waiting anxiously for my name to be called. coz i wanna dash home and sleep! i was so sleepy in there. After the breakfast, i straight away felt sleepy! ha! typical piggy! 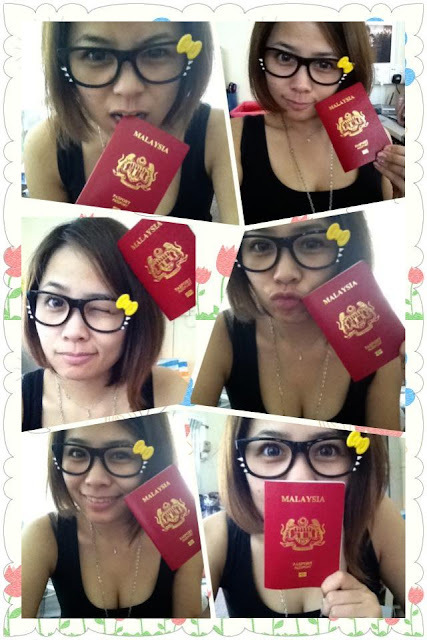 finally, my gorgeous name being called, took my passport and "My Bed, Here I Come~!" Took a few pic, and the next split second, im on my bed, asleep! haha. Yeah! Finally got my Passport done~!! !